“Sacred Objects, Sacred Space: Everyday Tools for the Modern-Day Witch” by Dayna Winters, Patricia Gardner, and Angela Kaufman isn’t necessarily a direct follow up to their first book “Wicca: What’s the Real Deal? Breaking Through the Misconceptions”, but if you were smart and followed my recommendation and bought their first book, this is an obvious “must buy”. For those of you who may need, or want, a bit more information than that, here we go. The ladies (Winters, Gardner, and Kaufman) did it again. 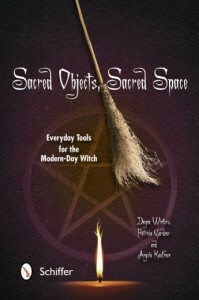 Just like “Wicca: What’s the Real Deal?”, “Sacred Objects, Sacred Space” manages to pack an insane amount of information into a compact little space. The writing never feels rushed or overwhelming, and yet in under 200 pages you will read about any tool you can imagine. Seriously! Here’s just a taste to get you going: potion bottles, cauldrons, poppets, Book of Shadows, candles, athame, mirrors, mala beads, singing bowls, and believe it or not, more! And with each item they discuss appropriate care, maintenance, and any cautions you need to be aware of with the item. I really enjoyed that with each item they also included craft ideas to decorate or personalize the items, or sometimes how to create the item from scratch. But that’s just the objects part of “Sacred Objects, Sacred Space”. When it comes to spaces, they leave nothing out; living rooms, closets, dorm rooms, offices, balconies, bedrooms, gardens, and more. They cover the use of color in the home and creating your home altar. If you want to know about everything that’s everything having to do with magical tools and spaces, “Sacred Objects, Sacred Space” is for you. Dayna Winters, Patricia Gardner, and Angela Kaufman (yes, of Moonlight Tarot) have created another book that seriously, honestly, and truly you should own. I hope they have another one in the works!